A grey dawn in 19443: on a street in Rome, two young women, complete strangers to each other, lock eyes for a single moment. One of them, Chiara Ravello, is about to flee the occupied city. The other has been forced at gunpoint on the back of a truck with her husband and children. As time stands still, Chiara makes a decision that changes her life for ever. Loudly claiming the woman's son as her own nephew, she demands and - to her amazement - secures his immediate release. Only as the trucks depart does she begin to realize what she has done. 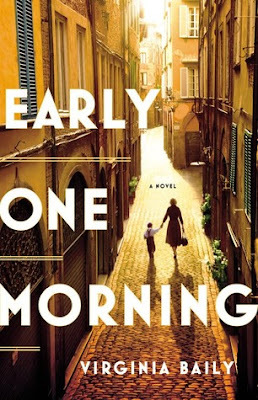 Early One Morning - a momentary and quick decision by a mother and Chiara changes the lives of a number of people. I have just finished reading a book set in war torn Germany during the second world war. Now Virginia Baily takes the reader into Italy - another country undergoing the ravages of war and being invaded. Chiara has lost her her fiance to anti-fascist activities and now she struggles to care for Cecilia her sister who has been damaged by a number of fits that have injured her brain. She does not welcome the young Jewish boy - Daniele Levi. The extent of that unwelcome is incredibly sad. Chiara flees to the country where her Nonna has a farm, taking with her Cecilia and Daniele. There they form an odd little community of people eking out an existence with the ever present fear of the German soldiers. Daniele is a silent unhappy boy. He does not realise he has been saved from a worse fate. How could he know, all he knows is being yanked away from his family into a life with strangers. His life with Chiara is never easy for either and eventually leads to complete separation. The story is told from a number of points of view - primarily from Chiaras, but also from Antonio - a friend of Chiaras and now a priest, and from a young girl - Maria who discovers her father is not who she thought. It is a shock that rocks her world and sends her on a journey. The novel weaves between the 1940's and the 1970's. In doing so the lives of the characters and what happened to them unfolds in a way that gradually reveals all that happened from that one lock of eyes between two strangers. At times I hated being dragged from one era into the next, yet it built tension and intrigue. It was well paced and had me reading on. I fell in love with this odd group of characters and their lives. While not a book I would normally pick up, the very real characters, the descriptive writing, the outcomes from that one choice - somewhat unexpected, fascinated me. I loved the small surprises that sprang out at unexpected times like a jack in the box. The motives and the love, the hopes, disappointments, the guilt and sadness that characters experienced all combined to bring them alive in my imagination. Early One Morning had me reaching for the tissues as it ended. This book would be an interesting read for book groups, I am sure it would engender much discussion and be relevant to people's lives today. Try a little bit of the audio to obtain a feel for the book. OOh Kathryn, this does sound excellent for book clubs and I know a few I'll be recommending it too. This sounds like an emotional read, will have to check this one out. Thanks for sharing! Wow, this sounds great. I could definitely see how this would be a good book club read, lots of conversation to be had. It was a bit out of my usual reading sphere, but have to say it was better than I thought it would be. I saw this one talked about at BEA, and I was so intrigued that I asked the publisher to send me a copy. I like historical fiction when there is a good character story.